Members of U.K. Parliament vote on amendments to Theresa May's Brexit withdrawal bill, in the House of Commons, London, Jan. 29, 2019. Renegotiate parts of the withdrawal agreement, at least the Irish backstop issue, is what emerged on Tuesday night as the British Parliament's majority position. Prime Minister Theresa May now has a mandate to go back to Brussels (again) in order to ask for concessions. However, the EU replies were fast and swift afterwards, arriving in a matter of minutes from across the English Channel and rather less encouraging: Council President Donald Tusk outright rejected any form of re-opening the contents of the withdrawal agreement. So that was that, or was it? Nevertheless, when compared with recent uncertainty about what the British Parliament actually wants regarding exiting Tuesday night's voting marathon at last produced a tangible position. Funny enough many observers had thought that a public vote about leaving the EU would produce nothing but that per result as the British population already spoke in 2016 demanding just that. It was then the task of the government to come up with a road map and seal a deal with the EU. Parliament was always only to be heard during the final stages of that process. But that road map was produced rather late and ultimately hammered out by the British government and Brussels without adequately consulting the views of elected office holders. It was always one of the most intricate details of Brexit: The anticipated final vote in Parliament and whether it would turn out in favor or against. Committees most naturally debated Brexit's manifold aspects but it was never meant to be actually voted upon in plenary until that crucial final session in Parliament which we all know by now so dramatically failed to seal off the government's deal with the EU in the middle of January of this year. The difference between Theresa May's previous and rather frequent visits to EU headquarters and her next trip, which will happen very soon, is that before she had to argue "we need to talk so that I can convince lawmakers of the benefits of my deal." Now she can say she no longer has to find out what Parliament wants as it clearly said so last Tuesday. The trouble with this otherwise promising development is that what London actually proposes to Brussels, seems to be a non-starter; in other words: U.K. position clear, prime minister sent off to Brussels to convey the message, but in principle a futile attempt as the EU made it crystal clear that the text of the withdrawal agreement including the infamous Irish backstop is not open for renegotiation. Or is it? Although it had been a victory for Theresa May and her government on Tuesday we heard a number of very angry voices after the last amendment had been voted upon. One of those critical voices accused the government of now trying to renegotiate the withdrawal bill in a sense of ditching the backstop and by doing so risking the future of the Good Friday Agreement which brought lasting peace to Ireland. Hence, many in Ireland argue that the backstop actually makes sense. Others would say that it unfairly ties Northern Ireland to the EU, should no trade deal be agreed upon at the end of the two year transition period. What is the most shocking aspect in all these new developments is the following: Would British lawmakers and the government not have known that if there is ever a truly contentious issue it is the Irish border subject? Granted, for example free movement and fisheries quotas are vital parts of how to define a common EU-U.K. relationship but these are technical, almost logistical details. Safeguarding hard-won peace between Northern Ireland and the Republic of Ireland is an altogether more delicate and much more relevant topic. The Irish backstop is aimed at guaranteeing this – never again a hard border even if EU-U.K. talks produce no precise result and no trade arrangements either. What Theresa May overlooked was that even many in her own party were never prepared to swallow that bitter pill. Yet these are longstanding successful and mature politicians – did they really hope that Brussels lets the entire U.K. leave without re-establishing whatever form of new border between Northern Ireland and the Republic in the case of a no-deal? Brussels cleverly used the border dispute to insist on what became then known as the backstop. London hastily agreed so as to have an agreement ready before March 29 approaches. The government completely underestimated the desire to leave without being tied into an EU customs union only because there was the Irish issue. Or so it seems. 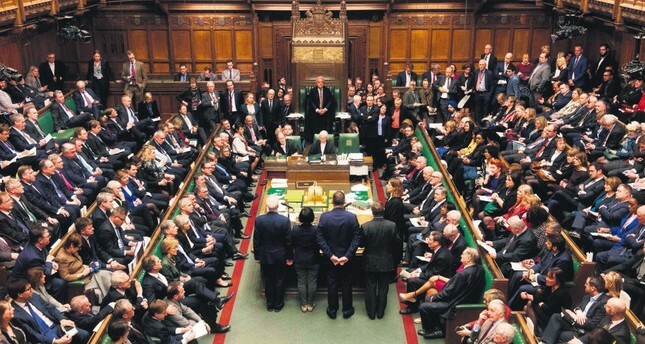 If it is true to assume that neither the European Union nor the United Kingdom want a hard Brexit and that it would above all else never pass in the British Parliament (one of the amendments accepted last night) the list of options for both sides has been drastically reduced. First, Brussels and London could first of all agree on adding an extension to the timetable, for example allowing London three more months to get a final parliamentarian majority ready. Possible! If that period is rather short there would be no need to field candidates for the May European Parliament elections either. Second, Theresa May goes to Brussels and somehow gets her way or at least a certain segment of it, perhaps an alternative to the backstop all but in name, resolving the infinity issue of being tied for too long to the EU's internal market mechanisms and Court rulings. Third, Theresa May either hopes for an affirmative vote on either Feb. 13 or 14, respectively. Running down the clock and letting her country crashing out in March 29 at 23:00 hours local time is no longer an option since last night's vote. The British Parliament not only produced at least some form of guidance for Theresa May, by no longer saying what it not wants but what it actually prefers. Most notably the leader of the opposition Jeremy Corbyn finally agreed to meet with the prime minister so as to discuss a majority in Parliament either for her current deal or perhaps for her amended deal upon returning from Brussels. Early elections seem thus to be off the political agenda and in all likelihood the possibility of a second referendum, too. What should be discussed in much more detail are alternative arrangements – for example smart technology avoiding the need for any physical checks of people or goods – for making certain there will never ever be a hard Irish-Irish border. After Tuesday it appears as if the ball is now – surprisingly – back in the EU's court. If London negotiates from a powerhouse position shedding the recent images of a nation divided and unsure about which Brexit it actually wants, Brussels might perhaps engage in a certain type of U-turn, too. Nothing is impossible in politics and ever more so should Dublin raise its concerns about a hard border ever more loudly. After all, the 27 remaining EU member states must ratify the final Brexit deal, too!